This article is about the quest. For the achievement, see Snow Bare Plunge. Celebrate the New Life Festival with the Nords of Eastmarch. Breda, a New Life Herald, spoke of Lower Yorgrim's New Life Festival in Eastmarch. Jump from Cub's Tumble in Windhelm. Jump from Horker's Drop outside of Windhelm. Jump from Dead Man's Fall west of Windhelm. Return to Breda to claim your rewards. To get this quest, you must first speak with Breda, south of Windhelm. She will give you one of 9 quests; you can abandon a quest and speak with her again to get a different one. 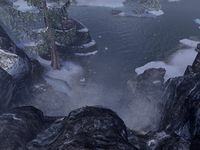 "The Nords of Lower Yogrim celebrate by traveling to remote places, stripping down to smallclothes, and leaping into the freezing water. You should take the Snow Bear Plunge! It is quite invigorating." "I'll mark your map with the route. Travel to each place, shed your clothes, and take a flying leap! Warm yourself at the bonfires before leaving. And share a drink with anyone else who takes the Plunge!" All right, I'll take the Snow Bear Plunge. The first place you must go to is Cub's Tumble, in Windhelm. Use a wayshrine to get there, or walk there; the location is on the docks in the east of Windhelm. Once you are at the location, jump off. (If you need the Snow Bare Plunge achievement, take off all clothing before jumping from any of the three locations. Otherwise, you can just wear your armor/clothing.) Jump into the marked section of the water. Doing this will afflict you with the Freezing status effect, slowing you down. This lasts for two minutes, but if you go to the fire, ten seconds of the remaining time will be taken off every second, meaning you will only have to wait 12 seconds. This is worth doing. The second place you must go to is Horker's Drop. This is on the bridge that leads into Windhelm, so go through the city and go to the bridge. Again, jump off the bridge into the specified area of water, and warm yourself up at the fire. The final place you must go to is Dead Man's Fall. This is west of Windhelm. There is no use in getting there via a wayshrine, as the location itself is just as close to your current location as any wayshrine. Instead, just walk there or use a mount. Once you are there (the location is at the top of a waterfall), jump down one last time, and again warm yourself up at the fire. Use the nearby wayshrine to return to Breda. "You're looking hearty and hale! And a bit frosty at the edges." I completed the Snow Bear Plunge. "I see that! You have a glow about you. Lower Yorgrim celebrates this way to show they don't fear what the cold brings. At the end of a winter's journey is a warm fire, good mead, and wonderful company. Also, it lets them compare tattoos!" To complete the Snow Bear Plunge, I must leap into the freezing water from three places in Eastmarch. First, I should head to Cub's Tumble. To complete the Snow Bear Plunge, I must leap from Cub's Tumble into the freezing water below. To complete the Snow Bear Plunge, I must leap into the freezing water from three places in Eastmarch. Next, I should head to Horker's Drop. To complete the Snow Bear Plunge, I must leap from Horker's Drop into the freezing water below. To complete the Snow Bear Plunge, I must leap into the freezing water from three places in Eastmarch. Finally, I should head to Dead Man's Fall. To complete the Snow Bear Plunge, I must leap from Dead Man's Fall into the freezing water below. This page was last modified on 17 December 2018, at 10:53.